Childhood obesity affects 1 of every 6 kids in the United States, in part due to a lack of physical activity. Historically, elementary schools provided daily recess and regular gym class, which offered opportunities for physical activity during the school day. More recently, emphasis on academic achievement, coupled with budget cuts, have prompted many schools to cut back on both recess and gym class. Parents’ opinions about these changes have not been examined at the national level. In January 2011, the C.S. Mott Children’s Hospital National Poll on Children’s Health asked parents of children age 6 to 11 about their views on physical activity in schools. Parents are virtually unanimous (94% agree) in their views about the importance of physical activity for elementary-school kids during the school day. However, one-third of parents think their kids do not get enough physical activity at school. Overall, a substantial proportion of parents feel their child’s elementary schools have too little time in gym class (35%), not enough playground equipment (26%) and too little time for recess (22%). 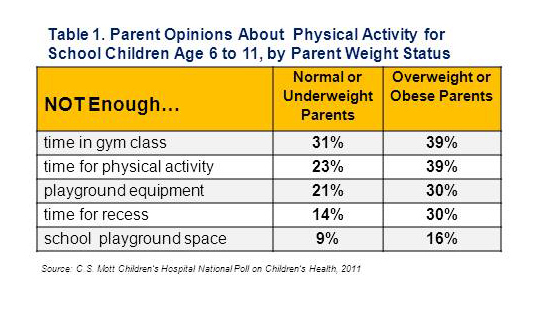 Parents’ own weight is related to perceptions of the need for schools to help children be physically active (Table 1). With regard to time for gym, playground equipment, time for recess and playground space, overweight and obese parents were more likely than other parents to say their kids did not have enough. Parents see many reasons why physical activity is valuable for their children—not just in preventing obesity but also in promoting healthy physical development. For parents of children in elementary school, it is critically important that children get the physical activity they need during the school day. Academic and budget pressures threaten schools’ ability to provide outlets and opportunities for children’s physical activity. Parents are noticing. School officials should note the strong support from parents on the importance of physical activity for elementary-age children. In particular, parents who rate themselves as overweight or obese are more likely to say that their children do not get enough physical activity at school, in both gym and recess. This is a new insight that indicates parents with their own weight challenges see schools as a key partner in battling obesity for their kids. This report presents findings from a nationally representative household survey conducted exclusively by Knowledge Network, Inc. (KN), for C.S. Mott Children’s Hospital via a method used in many published studies. The survey was administered in January 2011 to a randomly selected, stratified group of parents with children age 6 to 11 (n=718) from the KN standing panel that closely resembles the U.S. population. The sample was subsequently weighted to reflect population figures from the Census Bureau. The survey completion rate was 54% among parent panel members contacted to participate. The margin of sampling error is ± 2 to 6 percentage points. Davis MM, Singer DC, Butchart AT, Clark SJ. Gym gone but not forgotten? Parents want more physical activity for kids at school. C.S. Mott Children’s Hospital National Poll on Children’s Health, University of Michigan. Vol 12, Issue 3, April 2011. Available at: http://mottpoll.org/reports-surveys/gym-gone-not-forgotten-parents-want-more-physical-activity-school-kids.